Below is the best history that I can assemble of those early US and state highways routes through San Antonio, Bexar County, and the surrounding area at selected years between the formation of the state highway system and the start of construction of the Interstate Highway System. The years selected are those that I was able to find good information for and that represent significant changes in the system. In some cases, there were some intermediate route changes that were significant enough to mention; these are noted as a footnote in that route's detailed history. The information on this page was generally compiled from an assortment of old maps from a variety of sources as well as old TxDOT right-of-way maps. Each year below includes a detailed turn-by-turn description of each route from downtown outbound and use today's road names for ease of reference. I've also plotted the routes on Google Maps to make visualizing them easier. As I mentioned above, this is the best history I can glean from the resources I have found, and I have tried to cross-reference and correlate data as much as possible, but there may still be some inaccuracies. So if you have any corrections or additional information, please contact me. While a few states were starting to build statewide road systems at the turn of the 20th Century, there was as yet no organized road system in Texas. Instead, counties were responsible for building roads with the only direction from the state being to connect county seats with "first-class" roads. The result was that connections between towns were generally rough and often cobbled together using old stagecoach or wagon routes, cattle trails, ranch roads, or historical roads such as the Camino Real. Roads during this time were often just flattened earth where trees, brushes, stumps, and large rocks had been removed. There were few bridges-- most rivers and creeks were either forded or crossed using ferries. Roads that were considered "improved" at this time typically had a gravel or macadam surface. A few years into the new century, various groups, such as auto clubs, "good roads" groups, touring organizations, and chambers of commerce began to develop and mark numerous interstate "auto trails" throughout the country. This was typically done by identifying the best existing roads between towns and marking them using unique colored bands or other markings on telephone poles or signposts. In some cases, improvements were also made to the routes. Several of these auto trails traversed the San Antonio area including the King of Trails, Glacier to Gulf Highway, the Meridian Highway, and, perhaps most notably, the Old Spanish Trail (OST), which was headquartered in San Antonio. Around 1915, the US Post Office appropriated money to improve the road between San Antonio and Austin in order to speed mail delivery. The resulting 16-foot wide, macadam "post road" was considered the finest road in the state for several years. You can still find segments of this route named "Post Road" in New Braunfels and San Marcos. In those first years, the state highways just followed the established county roads along the designated corridors. But with federal and state funds now available and road building technology improving, the state quickly started improving those roads and, in many cases, built completely new routes to replace the older ones, especially ones that had winding, narrow, or unsafe paths between or through towns. These improvements resulted in the routings and numbering for many of the highways to change several times in a relatively short period. State Highway 27, heading northwest to Bandera, then north to Centerpoint and west through Kerrville and Junction to Sonora. By the mid '20s, this would be renumbered SH 81 and routed from Bandera through Medina to Kerrville and north to Fredericksburg, Llano, and beyond, eventually becoming SH 16. State Highway 41, running northwest with SH 9 to the Waring-Comfort area, then heading west to Kerrville, Ingram, Mountain Home and Rocksprings. By 1933, the stretch between Comfort and Ingram would be renumbered as part of SH 27 instead. State Highway 108, heading north to Blanco and beyond, was created around 1925. It was redesignated as State Highway 66 in 1931 and also extended south to Edinburg; this route eventually became US 281. Other states were also expanding their highway systems at this time. However, each state marked their highways differently. This, along with the frequent changes and the assortment of named trails that often overlapped the state routes, resulted in a messy and disjointed system for travelers. In 1925, in an effort to create a standard and consistent national highway numbering system, the American Association of State Highway Officials (AASHTO) created the US Highway System. Contrary to common perception, the US Highways were not a network of new federal roads. Instead, it was a system of identifying state highways that were deemed important interregional roads and numbering them with coordinated and consistent numbers so as to make it easier for interstate travelers to find their way. Texas began designating their US highway routes in 1927. In the first version of the US Highway System, the route northwest from San Antonio was numbered as US 290. It ran to Comfort, Kerrville, and on to Ft. Stockton; most of this route west of Mountain Home eventually became I-10. In Comfort, another road, US 385, started and headed northeast and north along the Old San Antonio Road through Bankersmith to Fredericksburg, San Angelo, and beyond. By 1928, it appears the route for US 385 was rerouted away from Comfort and instead headed south through Waring and Welfare to meet US 290 at Nelson City, likely to facilitate a more direct route to San Antonio. Although the official southern terminus for US 385 was listed as being at its junction with US 290, it appears that by 1932, US 385 was co-signed with US 290 into San Antonio. Then, in a 1935 revision of the system, US 87 was extended south from Wyoming into Texas and supplanted US 385. Contemporaneously, US 290 was rerouted east from north of Mountain Home through Fredericksburg, Austin, and on to Houston, leaving the segment from Comfort through Kerrville and Mountain Home as SH 27. Finally, a new road for US 87 from Fredericksburg to Comfort was completed by 1935 and the "Old Number 9" route through Bankersmith was removed from the state system. During the first years of the US Highway System, the existing state highway numbers were used alongside the new US route number. This was likely done so that travelers with older maps and those already familiar with the existing state routes could still easily find their way. The redundant state highway numbers were officially phased-out in a major renumbering of the state's highway system in 1939. Locally, this renumbering included changing the original SH 81 to SH 16; this was likely done to avoid confusion with the new US 81 as both ran through San Antonio. The chart below summarizes the changes to the different highways in San Antonio during those first couple of decades. It also shows the two forms of the state highway shield used in those early days. I'm sure all the changes caused quite a bit of confusion! 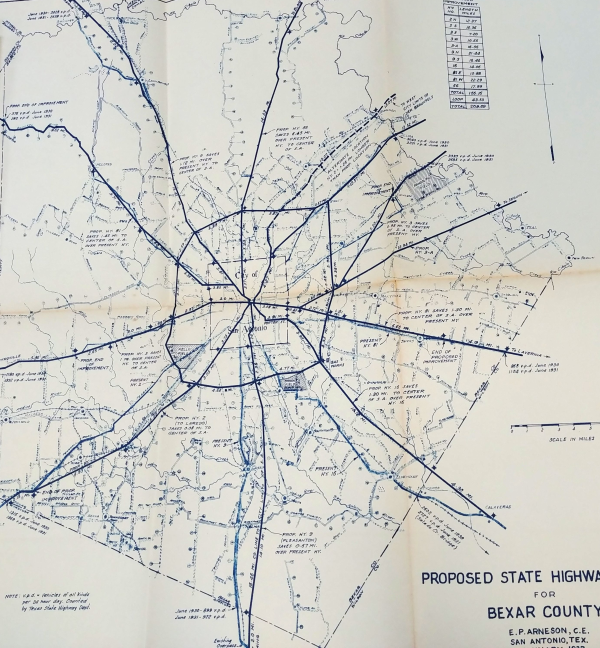 In 1930, the state authorized a study of existing highways in Bexar County and proposals to improve them. This study, by local engineer Edwin P. Arneson (for whom the Arneson River Theater is named), was completed in 1932. It recommended rerouting nearly all routes coming into San Antonio and widening and straightening sections that were not to be relocated. It also recommended the replacement of numerous railroad crossings with overpasses or underpasses and the elimination of all low-water bridges. The Arneson Plan was also the first official recommendation for a loop system around the city, parts of which were eventually manifested as Loop 13 and Loop 410. The entire plan was estimated to cost $9.4 million, or about $166 million in today's dollars. While only a few of his recommendations were adopted exactly as he prescribed, most of his concepts were eventually implemented in some form or another and the paths of several of today's highways can be traced back to this plan. Main Plaza was (and still is, to my knowledge) the "zero milepost" for San Antonio and thus was the logical destination for the first highways into San Antonio. 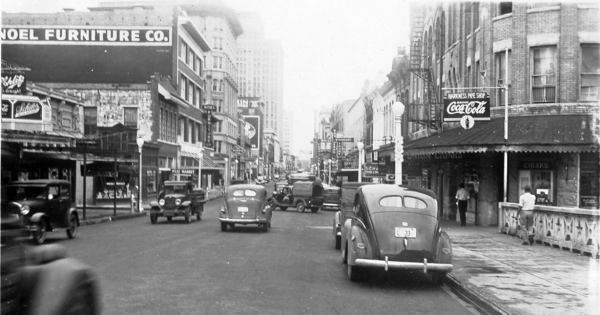 While both Commerce St. and Houston St. were initially used for routes through downtown, it appears that by the mid '30s, all of the east-west routes through downtown were trunked over Commerce St., which was two-way until about 1954. The convergence of all these routes and the dramatic growth in automobile traffic by the late 1930s caused severe congestion in the downtown area. To address this growing problem, officials began planning a series of "interregional highways" to carry through traffic around downtown. However, the outbreak of World War II delayed this initiative. After the war ended in 1945, the effort resumed and the first expressways opened in the late '40s and early '50s to provide a high-speed bypass around downtown San Antonio. The routings of state and US highways through the city were changed several times to use the new expressway segments as they opened. Note the US Highway shields on the lamppost and the two-way traffic. This map shows the earliest state highway routings in San Antonio I can verify. These routes generally followed the original county roads headed out of San Antonio to adjacent county seats. As a result, there are quite a few interesting paths for these routes and explains why some roads are named and/or laid-out the way they are to this day. For example, the following roads were named for the destinations of the routes that ran over them at this time: Castroville Rd., Bandera Rd./Old Bandera Rd., Fredericksburg Rd./Old Fredericksburg Rd., Austin Hwy./Old Austin Rd., Seguin St./Seguin Rd./Old Seguin Rd., Corpus Christi Hwy., Old Pearsall Rd., Bulverde Rd., and Pleasanton Rd. In addition, Goliad Rd., Houston St., Blanco Rd., and, perhaps most notably, Nacogdoches Rd. also represent previous routings of roads to those towns. New Braunfels Ave. may have also been so-named as it was part of routes to that town at various times. This route left downtown headed east on Houston St., then turned north on N New Braunfels Ave., passed through Ft. Sam Houston (Ft. Sam was open to the public until 2002), then turned east on Eleanor St. and veered onto Old Austin Rd. behind where the Botanical Garden is today, passed through Ft. Sam again onto Harry Wurzbach to Corinne Dr., then along Corinne and curving northeast onto Austin Highway (Austin Hwy. between here and Alamo Heights did not exist at this time), along Austin Hwy. and then east along today's Loop 410 through the town of Fratt. It then crossed today's I-35 and onto Sherri Ann Rd. and Randolph Blvd. before joining today's I‑35 at Judson Rd, then northeast from there. It's unclear if it followed Old Austin Rd. near the I‑35/Loop 1604 interchange at this time, but it seems likely. It's also likely that the route between today's FM 2252 and New Braunfels followed the current FM 482 through Comal and Solms, returning to today's I‑35 near Rueckle Rd. and into New Braunfels on W San Antonio St. to the plaza. There, the route turned right onto S Seguin Ave. and then left onto Faust St. where it crossed the Guadalupe River on the historic bridge there. It then followed the old Post Road north from there. Prior to SH 2, it appears the favored route to New Braunfels left downtown traveling north either along Austin St. (that seems appropriate) or possibly Broadway (then known as River Ave.) and turned east onto Grayson St., then north onto N New Braunfels and followed the rest of the route above. This route left downtown headed south and then west on S Laredo St. (parts of which are now missing between Nueva and El Paso Streets and also part of which is now I‑35), then turned south on S Brazos St. before veering southwest onto Frio City Rd. It continued along Frio City Rd. through today's Port San Antonio on a road that once connected Frio City Rd. to Old Pearsall Rd. (looking at a map, you can see how they line up; part of that road is now the Port San Antonio section of General Hudnell Dr.) The route then continued on Old Pearsall Rd. to Lytle and beyond. This route headed west from downtown along W Commerce St., then turned south on SW 24th St. traveling past Our Lady of the Lake. At that time, 24th St. continued straight south at El Paso St. to Castroville Rd. where the route then turned southwest and followed Castroville Rd. Past Callaghan, it zig-zagged a bit along today's US 90 right-of-way, crossed Leon Creek, then continued along what's now an abandoned stretch of Castroville Rd. behind the 9/11 Memorial before joining today's US 90 and heading west. It then curved onto Kriewald Rd. before rejoining today's US 90 at Loop 1604, then west to just past SH 211 where it used what's now Old Highway 90 West south of the current route to Jungman Rd. and a stretch of road that no longer exists between Jungman and Mechler Lane, where it rejoined today's route. Like SH 2 North, this route left downtown to the east along Houston St., then turned north on N New Braunfels Ave. It then turned northeast onto Seguin St. which joined today's I‑35 at Walters. Continuing northeast from there, the route left today's I‑35 at Salado Creek, following Seguin Rd. to the railroad underpass near I‑35 and Binz-Engelman, where it passed through the underpass and turned northeast on FM 78. The route followed Old Seguin Rd. through Kirby, then back onto FM 78 to Converse. There, it followed Upper Seguin Rd. to today's FM 1516 where it continued on Seguin Rd. through Converse and back onto today's FM 78 north of Converse. From there, it followed FM 78 on to the northeast past the future site of Randolph AFB, through Schertz, and on to Seguin. This route headed north from downtown on N Flores St. up to the Five Points intersection where it then followed Fredericksburg Rd. northwest all the way to north of Huebner and joined today's I‑10. From there it headed northwest, likely following Old Fredericksburg Rd. around today's Loop 1604 interchange, then rejoining I‑10 and continuing to Leon Springs. Through Leon Springs, it followed Old Frederickburg Rd., much of which is no longer in existence-- it ran parallel to and just to the east of the today's main road through Leon Springs (i.e. that little road behind Rudy's). There, it turned left onto Boerne Stage Rd. and followed it northwest and then curved north onto Scenic Loop Rd. and continued into Kendall County. The route entered Boerne on Old San Antonio Rd. and curved left onto Oak Park Dr. and right onto Main St. through Boerne. North of Boerne, the route crossed back and forth on today's I-10 right-of-way to Nelson City. There, the route curved onto today's FM 289 and onto the Waring-Welfare Rd. to the T intersection at Green Cedar Rd. There, SH 9 turned right to Welfare while SH 27 turned left and continued mostly on today's FM 289, Old Comfort Road, and High Street Rd., before crossing the Guadalupe River on the High St. bridge into Comfort. At some point prior to this, it appears there was another route between Leon Springs and Boerne that continued north-northwest from Rudy's on the Old Fredericksburg Road. It crossed Leon Creek, then crossed the former railroad tracks at Aue Road and continued northwest before heading back to today's I-10 at Buckskin Dr. It then followed I-10 to today's Fair Oaks Parkway where it left today's I-10, zig-zagging north and west to and along Cascade Cavern Road and then onto Old San Antonio Road. From there, it followed the rest of the route described above into Boerne. This route headed south from downtown on S Flores St., then south on S Pleasanton Rd. all the way through the South Side. At Ansley St., it veered to continue on Pleasanton Rd., crossed today's Loop 410, and continued south all the way into Atascosa County where it joined the route of today's US 281. Heading south of downtown on S. Alamo St., the route turned left onto S. Presa St. and continued to Pyron Ave. where it veered onto Corpus Christi Hwy. From there, it continued south and then east along the southern edge of today's Brooks City Base before turning south onto Southton Rd. (now Siluria St.). It then turned east again on San Juan Rd., crossing today's Loop 410 and then turning onto Old Corpus Christi Hwy. It followed that road through Elmendorf and continued on into Wilson County to Labatt Road where it continued on a stretch of road that no longer exists to join today's route of US 181 near Shannon Ridge Drive. At some point prior to SH 16, the route to the southeast appears to have followed this path: S Alamo St. to S Presa St, then veering southeast onto Carolina St. which then fed into Denver Blvd., where it continued east to Gevers St. There, it turned south onto Gevers and veered southeast onto Goliad Rd. The route then continued on Goliad which becomes Corpus Christi Hwy. and joins the route for SH 16 described above. Leaving downtown on N Laredo St. (parts of which are now gone between Houston St. and Martin St.), it curved west and northwest along San Pedro Creek and onto what's now the inbound lanes of I‑10 up to Poplar St. (which was named Castro St. at that time), then west on Poplar to Zarzamora St. There, it turned north briefly before turning west on Culebra Ave. and then veering northwest onto Bandera Rd. It followed Bandera all the way to Evers, where it then veered onto Evers and continued northwest, then turned west on Daughtry St. and then along today's Loop 410. (Today's Bandera Rd. between Wurzbach and Evers did not exist at this time.) It then turned onto a section of Bandera Rd. between Loop 410 and Wurzbach that no longer exists; this ran just to the west of today's Bandera Rd. From there, it followed Bandera Rd. northwest to Helotes where it followed FM 1560 west briefly to Riggs Rd. and continued on Riggs and Old Bandera Rd. through Helotes, then back onto today's SH 16 north of Scenic Loop Rd. (i.e. at the El Chaparral.) From there, it followed SH 16 into Bandera County. Around 1920, the route to Bandera may have used Cincinnati Ave. to Zarzamora St., then south on Zarzamora and west on Culebra to Bandera Rd. It appears Culebra did not connect to Fredericksburg Rd. until sometime around 1930. This route simply followed Houston St. east from downtown through St. Hedwig to La Vernia and onward. This route headed north from downtown on Broadway through Alamo Heights and turned northeast onto Nacogdoches Rd. It continued on Nacogdoches to Salado Creek where it turned northwest on a road that no longer exists to Wetmore Rd. There, it turned northeast again and followed Wetmore Rd. to the former community of Wetmore (at today's intersection at Thousand Oaks Dr.), then followed Bulverde Rd. north to the county line. The low-water bridge in the center of the photo is still there today below the current bridge. By 1936, US Highway route numbers had been well-established. Per the 1932 Arenson Plan to improve local highways, most routes through San Antonio and Bexar County had been significantly changed to use new wider and straighter roads. SH 66 and US 281 replaced the former SH 108 north from the city. Changes from 1926 are noted in bold below. The route left downtown along Broadway and turned northeast onto Austin Highway in Alamo Heights. It continued along Austin Hwy. and then east along today's Loop 410 through the town of Fratt and onto Randolph Blvd. before joining today's I‑35 at Judson Rd, then northeast from there. 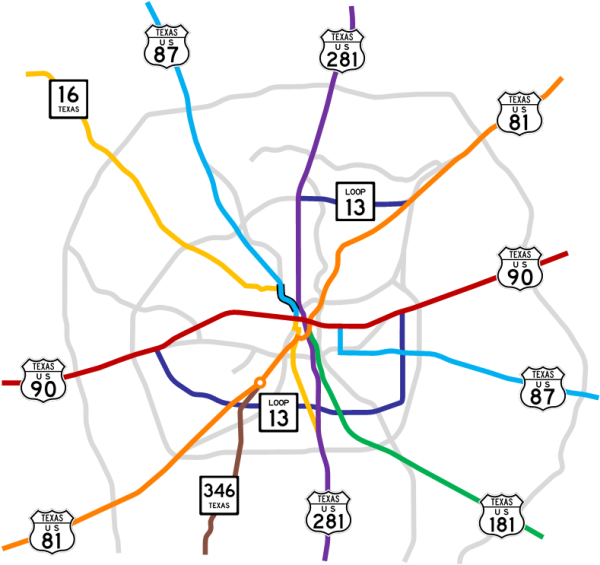 It used the current route of I‑35 through today's Loop 1604 interchange and beyond to Engel Rd. Just past there, it followed today's Old Hwy 81 to Solms and the current FM 482 back to today's I‑35 near Rueckle Rd. It then bypassed New Braunfels on the current route of Business 35, over a new Guadalupe River bridge, and then north from there to San Marcos on today's I‑35. 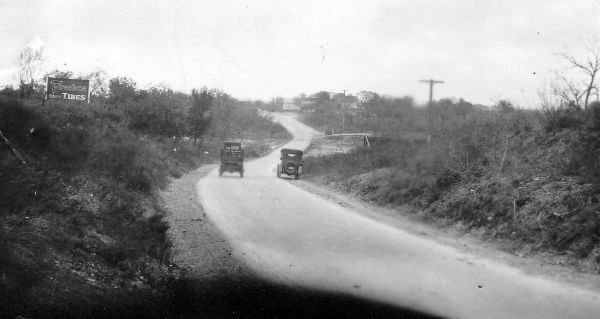 Sometime after 1926 but prior to the opening of Austin Highway through Alamo Heights in 1935, it appears this route was changed from its previous routing through Fort Sam Houston and instead went up Broadway to Cleveland Court, then right on Garraty Rd. and over to Harry Wurzbach, where it then followed the previous route north. This route headed north from downtown on N Flores St. up to the Five Points intersection where it then followed Fredericksburg Rd. northwest all the way to north of Huebner and joined today's I‑10. From there it headed northwest to Leon Springs. It then followed a new road through Leon Springs (now the former WB frontage road) and returned to today's I-10 near Aue Rd. It then ran along today's I‑10 all the way to Boerne and through Boerne on Main St. North of Boerne, the route used today's path of I-10 to Nelson City. There, the route curved onto today's FM 289 and followed it to Comfort crossing the Guadalupe on a new bridge (today's Business 87.) There, the route split to Kerrville and Fredericksburg. The route to Kerrville used today's SH 27 while the route to Fredericksburg used a new road that is today's US 87. This route replaced the E Houston St. route between downtown San Antonio and La Vernia. It left downtown along E Commerce St. It then turned south at S New Braunfels Ave. and followed that to Rigsby Ave. There, it turned east and followed today's path of US 87 to the east. In East Bexar County, it followed the paths of today's Loop 106 and Loop 107. It appears that this route was conceived at some point around 1930. Initially, this route was numbered as SH 81, having been rerouted here from its previous route on E Houston St. It appears the first version of this route left N. New Braunfels on Hedges St., turned right on Meerscheidt St., left on Virginia Ave., right on Mittman St., left on Vine St., veered right onto Clark Ave., then left on J St. to Roland Ave., and finally left onto Rigsby Ave. The complexity of this route likely led it to be altered to the simpler route listed above by 1936. This route headed west from downtown along W Commerce St. and veered southwest on Enrique Barrera Blvd. (Old Highway 90) before joining today's US 90 and heading west. It then curved onto Kriewald Rd. before rejoining today's US 90 at Loop 1604, then west to just past SH 211 where it used what's now Old Highway 90 West south of the current route to Jungman Rd. and a stretch of road that no longer exists between Jungman and Mechler Lane, where it rejoined today's route. This followed an entirely new route from San Antonio to Seguin. It left downtown headed east on Commerce St. and onto what's now I‑10 near E. Houston St. and then on to Seguin. Beyond Seguin, through, the route still meandered through Gonzales, Waelder, Columbus, Rosenberg, and Sugar Land before reaching Houston. Heading south of downtown on S. Alamo St., the route turned left onto S. Presa St. and continued to Pyron Ave. where it veered onto Corpus Christi Hwy. From there, it continued south and then east along the southern edge of today's Brooks City Base before turning south onto Southton Rd. (now Siluria St.). It then turned east again on San Juan Rd., crossing today's Loop 410 and then veering left at S. Presa and joining today's route of US 181 just east of there. This was a new highway that headed south from downtown on Main St., then left onto Navarro St. 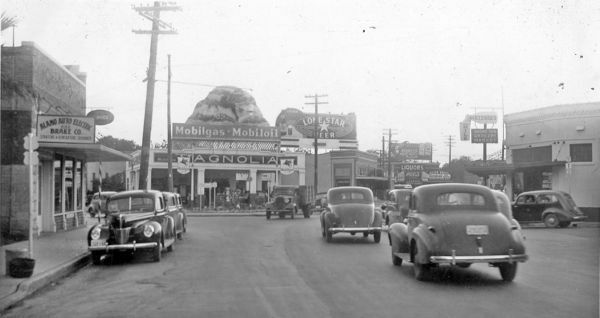 It then turned right onto S St. Mary's St. and onto Roosevelt Ave. (The railroad underpass near the Lone Star Brewery was under construction at this time; it would open in 1937.) It continued south on Roosevelt and onto the current route of US 281 south of today's Loop 410. This route headed south from downtown on S Flores St. and continued south-southeast on Flores to Roosevelt Ave. where it merged into the route for US 281/SH 66 (see below.) At Three Rivers, it split from US 281 and headed to Corpus Christi via Mathis; this eventually became the route for I‑37. This route followed the same route for US 87 north of downtown (see above) to Woodlawn Ave. There, it turned west and followed Woodlawn to Bandera Rd. It then veered northwest onto Bandera Rd. and followed it to Evers, where it then veered onto Evers and continued northwest, then turned west on Daughtry St. and then along today's Loop 410. (Today's Bandera Rd. between Wurzbach and Evers did not exist at this time.) It then turned onto a section of Bandera Rd. 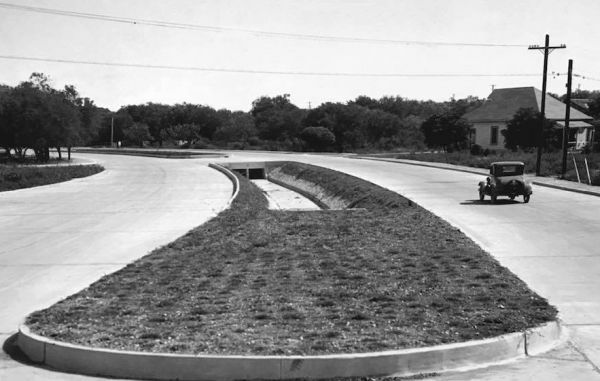 between Loop 410 and Wurzbach that no longer exists; this ran just to the west of today's Bandera Rd. From there, it followed Bandera Rd. northwest to Helotes where it followed FM 1560 west briefly to Riggs Rd. and continued on Riggs and Old Bandera Rd. through Helotes, then back onto today's SH 16 north of Scenic Loop Rd. (i.e. at the El Chaparral.) From there, it followed SH 16 into Bandera County. Around 1931, it appears this route was following W Commerce to Zarzamora, then north on Zarzamora to Culebra, then west on Culebra to Bandera Rd. In 1932, the route was changed to use Fredericksburg Rd. and Woodlawn Ave. The 1939 renumbering of state highways had now eliminated the state highway routes that were redundant with the new US routes. In the few years since 1936, some more significant changes in local routings had occurred. 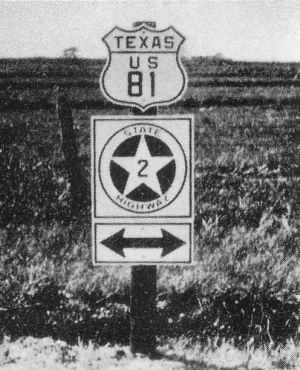 US 81 South was now using a completely new route and US 181 had been straightened near Brooks. Additionally, the former SH 81 was changed to SH 16 (likely to prevent confusion with US 81) and SH 9 through the area had been dropped with the section of it on S Flores being rolled into SH 16. In an effort to help relieve chronic congestion along Commerce St., US 81 was routed south on S Alamo St. to Flores St. In 1937, the state took over the existing Military Rd. (now Military Dr.) between Kelly Field and Brooks Field and designated it Loop 13 as the first segment of a planned loop around the city. Changes from 1936 are noted in bold below. The route left downtown along Broadway and turned northeast onto Austin Highway in Alamo Heights. It continued along Austin Hwy. and then east along today's Loop 410 through the town of Fratt and onto Randolph Blvd. before joining today's I‑35 at Judson Rd, then northeast from there on the current route of I‑35 to Engel Rd. Just past there, it followed today's Old Hwy 81 to Solms and the current FM 482 back to today's I‑35 near Rueckle Rd. It then bypassed New Braunfels on the current route of Business 35 and then north from there to San Marcos on today's I‑35. This was a new routing for this highway. It left downtown on S. Alamo St. and turned left onto S. Flores. It then veered right onto Nogalitos St. and continued southwest to a traffic circle at Aviation Blvd. (which today is part of Zarzamora St.) It then veered onto New Laredo Hwy. and followed it south and onto the current path of I‑35 near today's Loop 410 where it continued on to the southwest, following today's SH 132 into Lytle and merging with the previous route from there. This route headed north from downtown on N Flores St. up to the Five Points intersection where it then followed Fredericksburg Rd. northwest all the way to north of Huebner and joined today's I‑10. From there it headed northwest to Leon Springs and followed the road through Leon Springs (now the old WB frontage road) and returned to today's I-10 near Aue Rd. It then followed today's I‑10 all the way to Boerne and through Boerne on Main St. North of Boerne, the route used today's path of I-10 to Nelson City. There, the route curved onto today's FM 289 and followed it into Comfort. This highway left downtown along E Commerce St. It then turned south at S New Braunfels Ave. and followed that to Rigsby Ave. There, it turned east and followed today's path of US 87 to the east. In East Bexar County, it followed the paths of today's Loop 106 and Loop 107. This road left downtown headed east on Commerce St. and onto what's now I‑10 near E. Houston St. and then on to Seguin. East of Seguin, the route now went through Luling and Schulenburg to Columbus. The more direct route to Houston between Columbus and Katy via Sealy was nearing completion. Heading south of downtown on S. Alamo St., the route turned left onto S. Presa St. and continued on a new, straightened route between Pyron Ave. and Old Corpus Christi Hwy. where it joined today's route for US 181. This route headed south on Main St., then left onto Navarro St. It then turned right onto S St. Mary's St. and onto Roosevelt Ave. (The railroad underpass near the Lone Star Brewery was now open.) It continued south on Roosevelt and onto the current route of US 281 south of today's Loop 410. This route followed the same route for US 87 north of downtown (see above) to Cincinnati Ave. There, it turned west and followed Cincinnati to Bandera Rd. It then veered northwest onto Bandera Rd. and followed it to Evers, where it then veered onto Evers and continued northwest, then turned west on Daughtry St. and then along today's Loop 410. (Today's Bandera Rd. between Wurzbach and Evers did not exist at this time.) It then turned onto a section of Bandera Rd. between Loop 410 and Wurzbach that no longer exists; this ran just to the west of today's Bandera Rd. From there, it followed Bandera Rd. northwest to Helotes where it followed FM 1560 west briefly to Riggs Rd. and continued on Riggs and Old Bandera Rd. through Helotes, then back onto today's SH 16 north of Scenic Loop Rd. (i.e. at the El Chaparral.) From there, it followed SH 16 into Bandera County. SOUTH This route headed south from downtown on S Flores St. and continued south-southeast on Flores. The route then ended at Roosevelt Ave. The route started on Old Pearsall Rd. at Military Dr. and continued northeastward to Leon Creek, then turned east and southeast to Military Dr. and ran east along Military Dr. to the San Antonio River where it then turned northeastward and intersected S Presa St. about 100 yards north of the current intersection. Note the US Highway shields on the signpost at the left and, if you look closely, also at the right across the intersection. US 181 turned left onto Presa here while US 81 continued south on Alamo. There were only a few changes in the radial highways in the decade between 1940 and 1949, mainly straightening some of the remaining kinks in the older routes. A new route was added in 1946 when the road to Poteet and Jourdanton was designated as State Highway 346. Loop 13 was extended northwest to US 90 through the new Lackland AFB and east to WW White Rd. and then north to US 90. But the biggest change came in 1949 with the opening of the city's first expressway; it was a segment of US 87 that replaced the routing on Fredericksburg Rd. from Woodlawn into downtown. SH 16 was also adjusted to take advantage of the new expressway. Changes from 1940 are noted in bold below. This highway left downtown on S. Alamo St. and turned left onto S. Flores. It then veered right onto Nogalitos St. and continued southwest to a traffic circle at Aviation Blvd. (which today is part of Zarzamora St.) It then veered onto New Laredo Hwy. and followed it south and onto the current path of I‑35 near today's Loop 410 where it continued on to the southwest, following today's SH 132 into Lytle and merging with the previous route from there. This route left downtown headed north on the San Saba St. (NB)/Pecos St. (SB) one-way pair and entered the new expressway that started at the Martin St. intersection. The expressway ended and merged onto Fredericksburg Rd. at Woodlawn. The route then continued on Fredericksburg Rd. northwest all the way to north of Huebner where it joined today's I‑10. From there it headed northwest to Leon Springs and followed the road through Leon Springs (now the old WB frontage road) and returned to today's I-10 near Aue Rd. It then followed today's I‑10 all the way to Boerne and through Boerne on Main St. North of Boerne, the route used today's path of I-10 to Nelson City. There, the route curved onto today's FM 289 and followed it into Comfort. This road left downtown headed east on Commerce St. and onto what's now I‑10 near E. Houston St. and then on to Seguin. East of Seguin, the route followed today's route for US 90 to Houston. Heading south of downtown on S. Alamo St., the route turned left onto S. Presa St. and continued south and southeast and onto today's route for US 181. This route headed south on Main St., then left onto Navarro St. It then turned right onto S St. Mary's St. and onto Roosevelt Ave. It continued south on Roosevelt and onto the current route of US 281 south of today's Loop 410. SOUTH This route left downtown headed south on the San Saba St. (NB)/Pecos St. (SB) one-way pair and probably turned left onto El Paso St., then right onto S. Flores St. From there, it continued south-southeast on Flores to Roosevelt Ave. where it ended. This was a new route that started at the traffic circle on US 81 South at Aviation Blvd./Zarzamora St. and continued southwest on Somerset Rd. It then turned south onto Palo Alto and continued south to the Medina River where it made a dogleg to the east on Old Palo Alto Road to cross the river before returning back to today's route to Poteet. The route started at US 90 West and ran southeast along Military Dr. through Lackland AFB, then east along Military Dr. to WW White Rd., then north along WW White Rd. to I-10 East. You can see the on-ramp to the new expressway at the left and the curve up to Fredericksburg Rd. from the end of the expressway just past the overpass at the right. This was the last year before the construction of the Interstate Highway System began and therefore the last year in this historical review. Locally, this period saw the most changes in local highway routings in decades as two new sections of expressway north and south of downtown were completed. Although primarily designed to be a bypass for US 81, the two new expressway segments facilitated changes to all the other routes so that they could now completely bypass the downtown core. The other linchpin for this was the construction of Steves Ave. connecting Probandt St. to Rosevelt Ave. and S. Presa St. This new road allowed the three southeastern routes to be trunked and shunted westward south of downtown. There, they were routed onto the new expressway and the San Saba/Pecos one-way street pair along the west side of downtown. Another significant change during this time was the routing of SH 16 North-- it had now been changed to use a dramatically improved section of Culebra Ave. and Bandera Rd. And finally, Loop 13 had been extended north on the East Side to US 81 at Fratt, then west from there to San Pedro. Changes from 1950 are noted in bold below. This route left downtown headed north on the San Saba St. (NB)/Pecos St. (SB) one-way pair and entered the new US 81 expressway at Travis St. It then followed the expressway northeast to its end at Broadway where the route then turned left onto Broadway. From there, it followed Broadway north and turned northeast onto Austin Highway in Alamo Heights. It continued along Austin Hwy. and then east along today's Loop 410 through the town of Fratt and onto Randolph Blvd. before joining today's I‑35 at Judson Rd, then northeast from there on the current route of I‑35 to Engel Rd. Just past there, it followed today's Old Hwy 81 to Solms and the current FM 482 back to today's I‑35 near Rueckle Rd. It then bypassed New Braunfels on the current route of Business 35 and then north from there to San Marcos on today's I‑35. This route left downtown headed south on the San Saba St. (NB)/Pecos St. (SB) one-way pair and entered the new US 81 expressway at Guadalupe St. The expressway ended and merged onto Nogalitos St. The route then continued southwest on Nogalitos St. to a traffic circle at Zarzamora St. where it veered onto New Laredo Hwy. and followed it onto the current path of I‑35 near today's Loop 410. It continued on to the southwest, following today's SH 132 into Lytle and merging with the previous route from there. This route left downtown headed north on the San Saba St.(NB)/Pecos St.(SB) one-way pair and entered the US 87 expressway at the Martin St. intersection. The expressway ended and merged onto Fredericksburg Rd. at Woodlawn. The route then continued on Fredericksburg Rd. northwest all the way to north of Huebner where it joined today's I‑10. From there it headed northwest to Leon Springs and followed the road through Leon Springs (now the old WB frontage road) and returned to today's I-10 near Aue Rd. It then followed today's I‑10 all the way to Boerne and through Boerne on Main St. North of Boerne, the route used today's path of I-10 to Nelson City. There, the route curved onto today's FM 289 and followed it into Comfort. This highway left downtown headed south on the San Saba St. (NB)/Pecos St. (SB) one-way pair and entered the new US 81 expressway at Guadalupe St. and immediately exited at S. Alamo St. It turned left onto S. Alamo and followed it to Probandt St. It veered onto Probandt and turned left onto Steves Ave. It continued on Steves to S. Presa St. where it turned left (north) and then made a right turn (east) onto Highland Blvd. From there, it followed Highland Blvd. 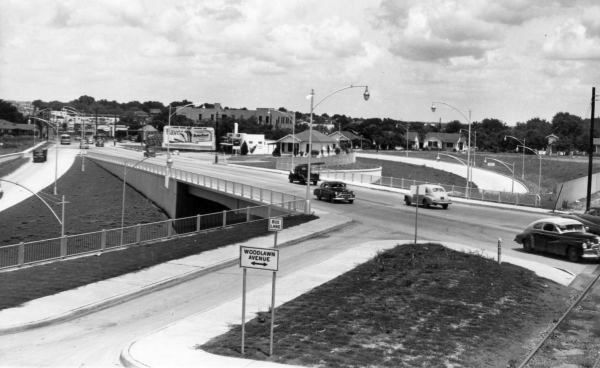 east to S. New Braunfels Ave. (Highland at this time continued east through what's now the I‑10/I‑37 interchange). There, it turned left (north) onto S New Braunfels before turning right again onto Rigsby Ave. It then followed today's path of US 87 to the east. In East Bexar County, it followed the paths of today's Loop 106 and Loop 107. This route headed west from downtown along W Commerce St. from San Saba and veered southwest on Enrique Barrera Blvd. (Old Highway 90) before joining today's US 90 and heading west. From W. Commerce St. on the west side of downtown, the route turned south on the San Saba St. (NB)/Pecos St. (SB) one-way pair where it entered the new US 81 expressway at Guadalupe St. and immediately exited at S. Alamo St. It then turned left onto S. Alamo and followed it through Southtown, crossing S. Presa St before veering right onto Water St. It then followed Water St. through what's now Hemisfair Park back to E Commerce St. at Elm St. where it turned right. It then headed east on Commerce St. and onto what's now I‑10 near E. Houston St. and then on to Seguin. East of Seguin, the route followed today's route for US 90 to Houston. Starting at the US 81 South expressway at S. Alamo St., the route followed S. Alamo southeast to Probandt St. It veered onto Probandt and turned left onto Steves Ave. It continued on Steves to S. Presa St. where it then turned right. From there, it continued south and southeast on S. Presa and onto today's route for US 181. This route left downtown headed north on the San Saba St. (NB)/Pecos St. (SB) one-way pair and entered the new US 81 expressway at Travis St. It then followed the expressway briefly before exiting at San Pedro Ave. and turning left. It then followed San Pedro Ave. north to Blanco, Johnson City, and beyond. This highway left downtown headed south on the San Saba St. (NB)/Pecos St. (SB) one-way pair and entered the new US 81 expressway at Guadalupe St. and immediately exited at S. Alamo St. It turned left onto S. Alamo and followed it to Probandt St. It veered onto Probandt and turned left onto Steves Ave. It continued on Steves and turned right onto Roosevelt Ave. It continued south on Roosevelt and onto the current route of US 281 south of today's Loop 410. This route left downtown headed north on the San Saba St. (NB)/Pecos St. (SB) one-way pair. At Martin St., it entered the new expressway and followed it to the northwest. It then exited at Culebra Ave., turned west, and followed Culebra to Bandera Rd. There, it veered northwest onto Bandera Rd. and followed it to Helotes where it veered onto Old Bandera Rd. through Helotes, then back onto today's SH 16 north of Scenic Loop Rd. (i.e. at the El Chaparral.) From there, it followed SH 16 into Bandera County. SOUTH This road left downtown headed south on the San Saba St. (NB)/Pecos St. (SB) one-way pair and entered the new US 81 expressway at Guadalupe St. and immediately exited at S. Alamo St. It turned left onto S. Alamo and then right onto S. Flores St. From there, it continued south-southeast on Flores to Roosevelt Ave. where it ended. The route started at US 90 West and ran southeast along Military Dr. through Lackland AFB, then east along Military Dr. to WW White Rd., then north along WW White Rd. 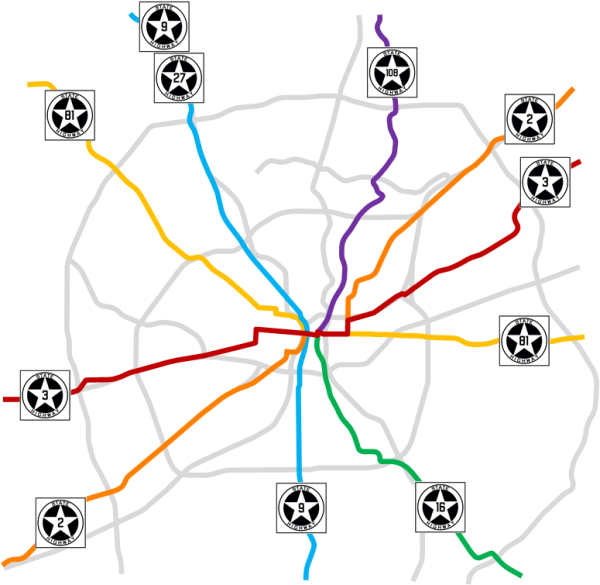 to Loop 410, then north along Loop 410 and I-35 to Randolph Blvd., then west along Loop 410 to San Pedro Ave.
By 1959, the elevated "Central Expressway" along the west side of downtown connecting the three previously completed sections of expressway north and south of downtown was complete and open to traffic. This allowed all the routes except US 90 that had previously been using the San Saba/Pecos one-way street pairs to now pass over the west end of downtown without stopping. At that time, this was a big deal! 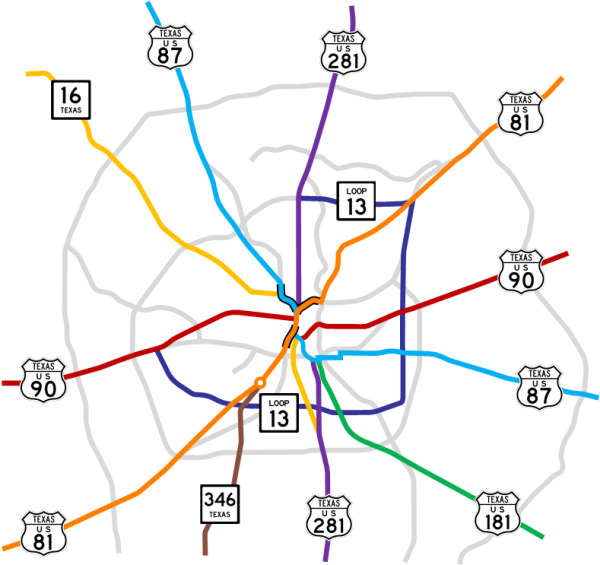 As the Interstates were built and the city's expressway system was expanded, all of the US Highways through the city were routed over them with the exception of US 87 East. 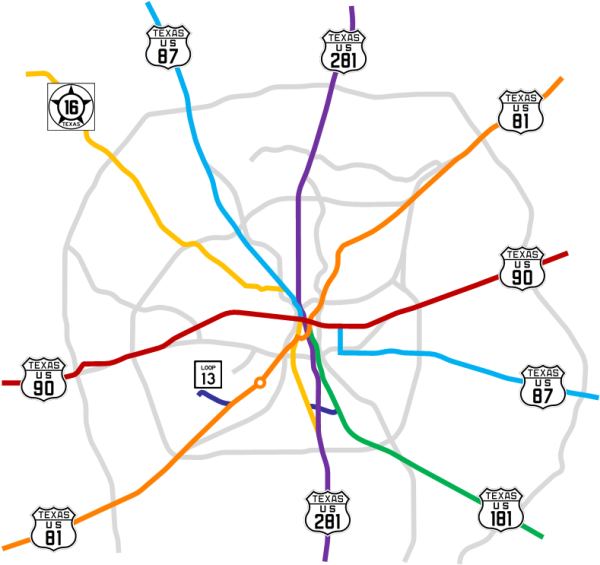 US 81 was routed along I‑35, US 87 North was routed on I‑10 West, US 90 East was routed over I‑10 East, and part of US 281 South was routed over I‑37 and Loop 410. 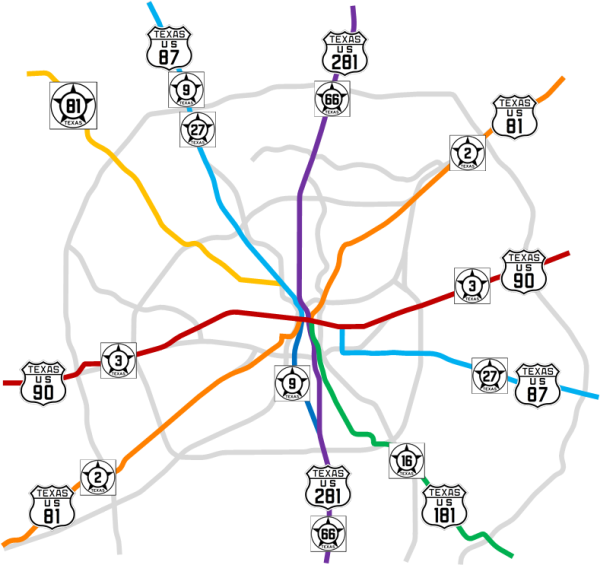 US 181 was truncated at I‑37 and US 90 West and US 281 North were routed over their own new expressways. In several cases, parts of the old highway routes in the outlying areas were upgraded in-place to Interstates or expressways. After the US Highways were moved to the Interstates and expressways, some of the roads were decommissioned as state highways and returned to the city for maintenance, but most of the old routes through the city were kept as state highways. These were renumbered as State Loops or Spurs. Three of them-- Fredericksburg Rd., Austin Hwy./Broadway, and New Laredo Hwy./Nogalitos were actually signed as Business US 87 and Business US 81 respectively until about 1991 even though they officially carried different state highway numbers. For unknown reasons, Old Highway 90, Commerce St., and San Pedro inside Loop 410 did not remain part of the state highway system. The table below summarizes the route changes after 1960. NORTH 1962: The stretch between I‑35 and Loop 410 was renumbered and the section along Randolph Blvd. was decommissioned. Was signed as Business US 81 until about 1991. 2014: The section from I‑35 to Alamo Heights was decommissioned. SOUTH 1961: Renumbered in 1961. Was signed as Business US 81 until about 1991. NORTH 1962: Remaining portion north of Woodlawn was renumbered. Was signed as Business US 87 until about 1991. 2014: The section from Woodlawn to Balcones Heights was decommissioned. 1970: Routed over I‑10 East and Roland Ave. and the previous segments west of Roland were decommissioned. 1968: Replaced by US 90 expressway. Old Highway 90 (Enrique Barrera Pkwy) and W Commerce decommissioned. 1968: Routed over I‑10 East. E Commerce St. decommissioned. 1974: US 181 truncated at I‑37 with the section from there to Loop 13 (SE Military) renumbered as Spur 122. The remaining route was decommissioned. NORTH 1978: San Pedro north of Loop 410 to the new US 281 expressway renumbered while San Pedro inside Loop 410 was decommissioned. SOUTH 1978: US 281 north of Loop 410 routed over Loop 410 and I‑37 and the stretch of former US 281 between Loop 410 and I‑35 renumbered. NORTH 1965: SH 16 south of Loop 410 routed over Loop 410 to Poteet-Jourdanton Freeway and the segment inside Loop 410 renumbered. 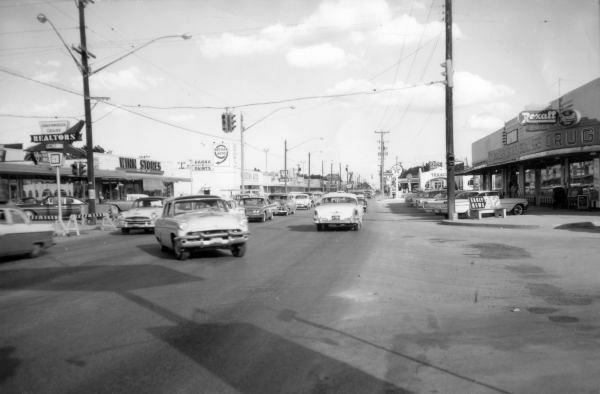 1964: S. Flores St. route decommissioned. 1957: The section south of I-35 to Zarzamora was upgraded with the construction of I-35. 1964: Section of the route north of I‑35 decommissioned. 1965: SH 346 south of Loop 410 renumbered to SH 16, SH 346 north of Loop 410 to I‑35 renumbered to Spur 422, and SH 16 north of Loop 410 routed over Loop 410 to Bandera Rd. Since it was completely co-existent with I‑35 (and therefore superfluous), US 81 south of Ft. Worth was decommissioned in 1991. Starting in 2014, some sections of those old US highways were decommissioned by the state and returned to the City of San Antonio as part of TxDOT's "turnback" program to help reduce maintenance costs. Those sections are Broadway from I‑35 to Alamo Heights, Fredericksburg from I‑10 to Balcones Heights, and San Pedro from Loop 410 to US 281.